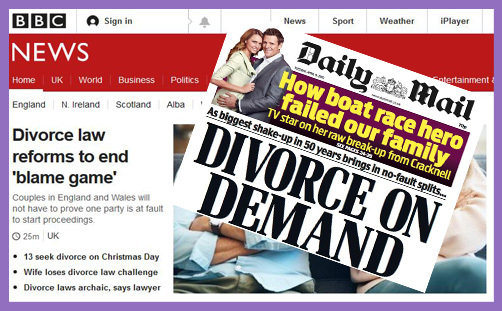 On the day plans were announced to reform the divorce laws in the UK to remove all reference to blame, the Daily Mail published a front page headline: ‘How Boat Race Hero failed our family‘. The wife of double Olympic champion and TV celebrity James Cracknell had done what countless men and women have done throughout the ages when experiencing marital difficulties – she told anyone who would listen. This is a sad and tragic state of affairs. One wishes it didn’t happen; one wishes folk could be more dignified; one wishes they would pause and think about the effects on the children, but this is the fallen world we live in, and none but the holiest saints are at their best when feeling hurt and rejected. The idea of ‘no-fault divorce’ is attractive. Anybody who has worked in the field will know and understand the immense and enduring pain experienced when the most trusting and intimate relationships fracture. Rejection makes none of us happier: it is a fundamental emotional harm, and when inflicted by someone we once loved, rationality tends to go out of the window. It is the most obvious response of enlightened liberal people to say that removing the identification of the grievance from the legal processes is the rational thing to do, and they are right. It is indeed the most rational, but which of us at such a time is rational? Maybe rationality is not the whole story. Psychologists sometimes advise their patients that bottling up feelings of resentment and anger has unhealthy consequences. Repressed emotions, unidentified resentments and that which needs to be said left unsaid are, in other contexts, identified as contributors to poor mental health outcomes, often with consequences for children. The polite, icy smile; the casual ‘I’m alright’ when asked how one is, can often overlay a maelstrom of underlying anger that will often come out later – at work, with the children, the extended family, or even in road rage. If one of the parties has celebrity status, it might even come out in the national press. And if one is not in the higher echelons of society, there’s always the ‘Jeremy Kyle Show’. What those outlets tell us is that there is, in such tragic circumstances, a deep, visceral need to express emotion. On a more elevated plane it expresses a sense of justice: one of the first ethical statements a child expresses is: ‘That’s not fair.’ Getting to the root of what went wrong may not be a pointless exercise. Addressing those feelings may be both helpful and healing by sharing them with the one to whom you once pledged “to have and to hold from this day forward, for better for worse, for richer for poorer, in sickness and in health, to love and to cherish, till death us do part, according to God’s holy ordinance; and thereto I plight thee my troth”. Even if one has had a secular marriage, alternative self-constructed sentiments and/or promises are exchanged which once meant something. It may be hard to ask, but are we absolutely sure that the best official response to the repudiation of all that hope and expectation is ‘meh’ and a shrug of the shoulders? When I first began practising family law, the response to the major change of the Divorce Reform Act 1969 was just beginning to work its way through the Courts. There was a surge through the system as decades of marital misery was finally having an outlet. As a young liberal I had studied the legislation and was fine-tuned and ready to help people liberate themselves from the overly restrictive constraints. I knew all the arguments. A rather worldly-wise and experienced barrister put me right. A dry, rather laconic man, he observed that when spouses separate they have a fundamental need to have an emotional reckoning: if you don’t let them address the real reasons for their fractures, they will find others, engaging in proxy disputes over the house, the pension, or, most tragically of all, the children. I soon learned how prescient that was. You will often have a wholly disproportionate dispute over trivia. A husband I once represented was so damaged by his wife’s betrayal that it took me three hours to encourage him to surrender a fridge freezer in return for his wife abandoning claims on half a house. On another occasion, the lengthy sticking point in corridor negotiation was a children’s clock. Evaluating one’s own contribution to a marital failure is not a waste of time. Removing that discussion from the formal processes may not remove acrimony as reformers hope and claim. Indeed, it will almost certainly simply displace the discontent. I confidently predict that, as a society, that we will not be prepared to invest what it takes to address this through other processes, such as mediation or reconciliation mechanisms. If you do not negotiate the drawing of a line in some form, such as the divorce petition, the resentments will not go away. It may sound old-fashioned to talk about not undermining the institution of marriage, and doing so will almost certainly not stop the changes. But it is, nevertheless, worth the churches using the debate to flag up the downsides to the ‘progressive’ agenda. One law that is never repealed is the law of unintended consequences. The undermining of marriage, the abandonment of social stigma, the widespread movement of mothers into the work place or onto state dependency have all had consequences. Once it mattered for a woman to choose a man of good character and economic reliability to father her children. Once stability in that bond was the foundation of community. Making a good choice mattered: there were upsides to that change, but there were downsides too. Is it too fanciful and ‘unacceptable’ to attribute the chaos of drugs culture and associated knife-crime, at least in part, to the undermining of the institution of marriage as an important, normalising and civilising influence? Certainly the children of the successfully married seem to have statistically better outcomes. The genie is probably out of the bottle, but, however counter-cultural, the Church of England – the Established Church – needs sensitively but clearly to speak of the value of and reasons for the sacrament of Holy Matrimony. Our contribution may not prove determinative, but we should nevertheless be clear. Marriage matters.